Nationally, research has shown that Latinos are already much less likely to access services for older people from mainstream providers, often because those agencies don’t have Spanish-speaking employees or materials. Latinos are also less likely than the population as a whole to have access to transportation to get them to those services. This is one of many stories that reflect what an impact this can have on an individual, family and ultimately a community. Mary Dolo Young is a fellow with Colorado Latino Age Wave, a Rose Community Foundation special initiative. Mary is working on transportation issues faced by Latino older adults. She writes about meeting Gabriel Zavala through her work with Via Mobility Services. 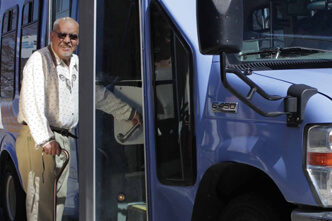 Mr. Zavala signed up for the paratransit program and Mary worked with him one-on-one doing travel training. The long arc of Gabriel Zavala’s life from Augascalientes, Mexico to Longmont, Colorado is marked by historical events such as the Green Revolution, NAFTA and the Great Recession. His father died in 1958 when he was three. His mother supported him and his siblings through hard work in the vineyards of Aguascalientes. Viejo Vergel, Presidente and Don Pedro brandys were all made from the grapes she picked. They grew corn, beans and potatoes on a small patch of land adjacent to the vineyard. In summer it was a feast, but come winter it was a famine of old, hard tortillas with milk – when the milk was available. Gabriel loved to read, but fourth grade was the end of the line for this boy growing up in rural Mexico. He was good at school and his teacher wished he could keep going, but it was simply not feasible. At that time, crop cultivation was rapidly changing. More machines meant fewer hands were needed. Gabriel noticed that tractors often broke down and that their repair often involved welding. Seeing an opportunity, he learned the welding trade. He loved making useful items from little pieces of metal. To him it was beautiful work. He married in 1976. He was 21 years old; she was 15 years old. They are married still. In 1978, he took a harrowing journey to the United States with cruel and swindling coyotes. After which, Gabriel ended up in the fields of Fresno, California where there were peaches, nectarines, oranges and lemons. Peaches were his least favorite crop. The feeling of the peach fuzz on his neck was unbearable. He later moved on to Santa Maria, California to harvest lettuce, strawberries, broccoli and cauliflower. Gabriel ping-ponged between the United States and Mexico for years. He lead a double life – field worker here and family man there. In 1994, he received legal status. In 1995, he applied for his family’s legal status, but received visas for only his wife and one daughter. One son and two daughters, to this day, still live in Mexico. He sees them infrequently. In 2002, hearing through relatives that there were good jobs to be had at a turkey plant in Longmont, they moved to Colorado. Shortly thereafter, he started working at the Butterball plant. After later being laid off from Butterball, he landed a job at a lumber yard. He lost that job when the Great Recession hit. He began having seizures in the 1970s, but there was never any time or money to go to the doctor. The years spent planting and harvesting in the field and years spent heaving 60,000 pounds of turkey on a daily basis also had grave physical impacts. In 2009, after being laid off from the lumber yard, he had a major seizure. He survived the brain tumor surgery despite the bleak odds of 9 to 1. As a result, his optic nerves are now damaged. Out of his left eye he has only fuzzy, tunnel-like vision that is bothered by bright light. Noisy rooms give him headaches, a fact that he laments because he loves nothing more than parties and music. The worst lingering effects, however, were not the physical ones. The worst effects were the environmental and psychological ones. Enduring day upon day of isolation can take its toll. But Gabriel Zavala is resourceful. He received travel training and has acquired bus riding skills that enable him to get out and about. He makes weekly trips to the Longmont Senior Center where he has made many friends by participating in a Spanish conversation group. He goes to the library, to Wal-Mart (“just to look around”), grocery shopping and to the butcher. He can often be spotted around town in the tow of his two grandchildren. Gabriel has endured a hard life. To meet him, though, you would never know. He is optimistic, gregarious and not lacking in friends. The enviable outlook of an affable man. Learn more about Colorado Latino Age Wave at rcfdenver.org/content/colorado-latino-age-wave.